Engraving of the outline of a temple to Mahadeva at Badoli by Edward Francis Finden (1791-1857) after Patrick Young Waugh (1788-1829). 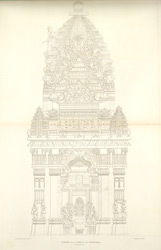 Plate 5 of James Tod's 'Annals and antiquities of Rajast'han or the Central and Western Rajpoot States of India' published in London in 1832. Badoli, situated south west of Kota in Rajasthan, is the site of three fine examples of 10th century Hindu temple architecture. All three temples at the site are dedicated to Shiva, also known as Mahadeva 'the Great God'. This engraving shows the elaborate nature of the design. While the walls are decorated with sculpted figures, the summit is crowned by a pot finial.